THIS PRODUCT HAS BEEN DISCONTINUED AND REPLACED BY THE DHXR4. The Galaxy Audio Quad is a single space rack mount receiver chassis, which may be loaded with up to 4 UHF diversity wireless mic receivers. Each of the receivers features an LCD display, 96 selectable channels, RF/AF indicators, and volume control. The chassis has an individual balanced XLR output for each receiver, and a mix output (balanced XLR and unbalanced ¼” jacks) with a Hi/Low level switch. 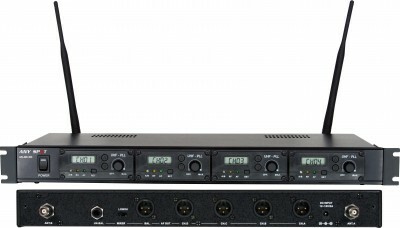 The mix output provides a mixed signal from all of the receivers, based on the individual volume control settings. This mix output is very useful when main mixer input channels are in short supply. The internal antenna distribution system allows the 2 detachable antennas to serve all of the receivers. In addition, the Quad chassis provides power to all 4 receivers while occupying only 1 AC outlet. The Quad is perfect for churches, schools, and any live sound application. This unit will save you at least 2 full spaces in your rack. There are multiple transmitter options for the Quad receivers. Choose between Dynamic or Condenser handheld microphones or a body pack transmitter (with multiple headset & lav options). Each transmitter features an LCD display showing channel number, frequency, and battery level. All transmitters feature a mute switch and run off of 2AA batteries (can be rechargeable).